We were back on the trails after a long break following our New Years Day outing. 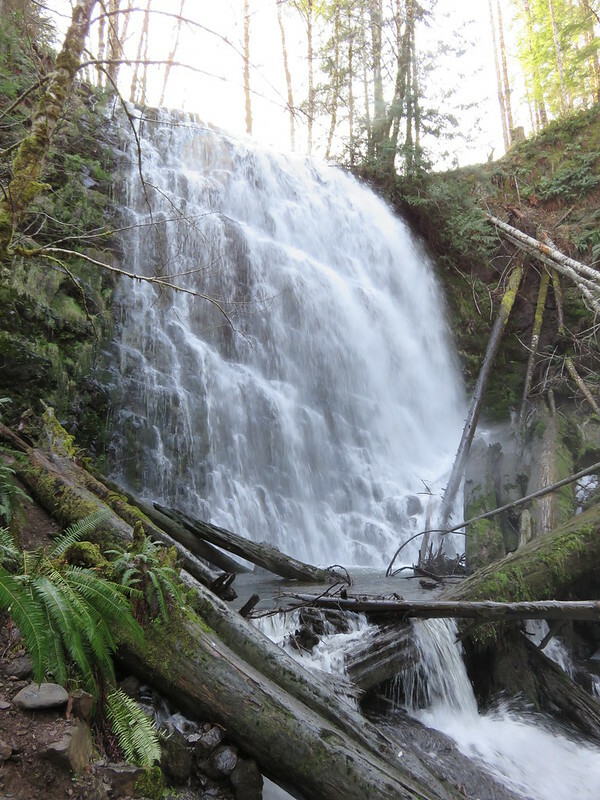 This month we were looking for a hike involving waterfalls to take advantage of the higher water flows of late winter. 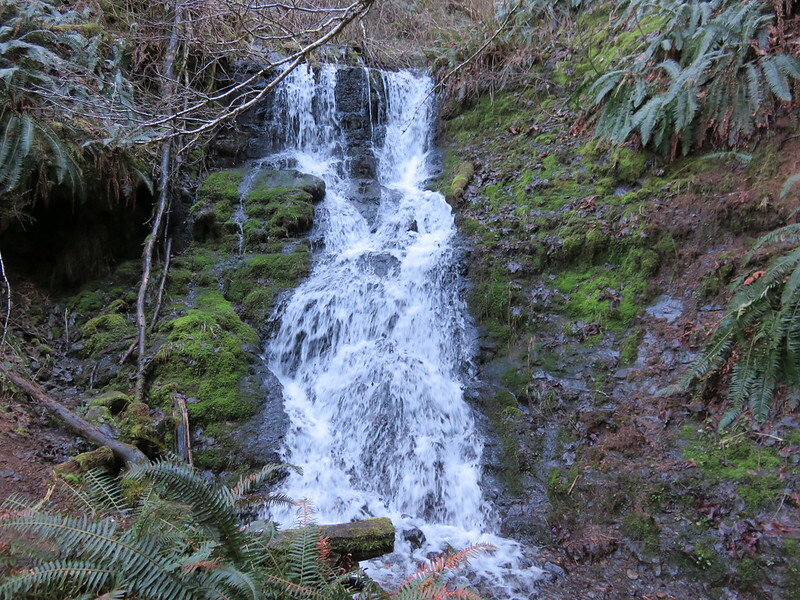 We wound up heading to the Tillamook State Forest to check out University Falls and the Gales Creek area. 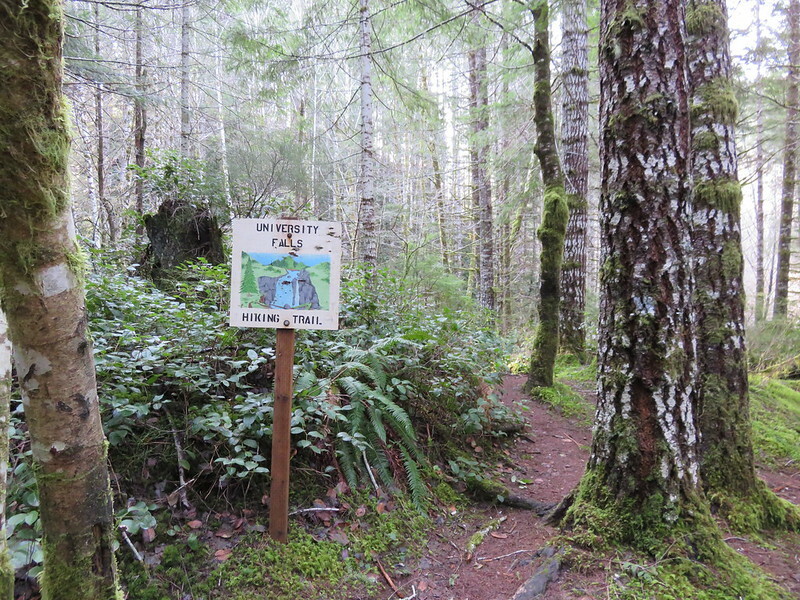 There were several options as far as trails went, a half-mile trail beginning above University Falls, a longer loop passing the falls starting at Rogers Camp on the south side of Highway 6, or starting at one of the trailheads along the Gales Creek Loop on the north side of the highway. 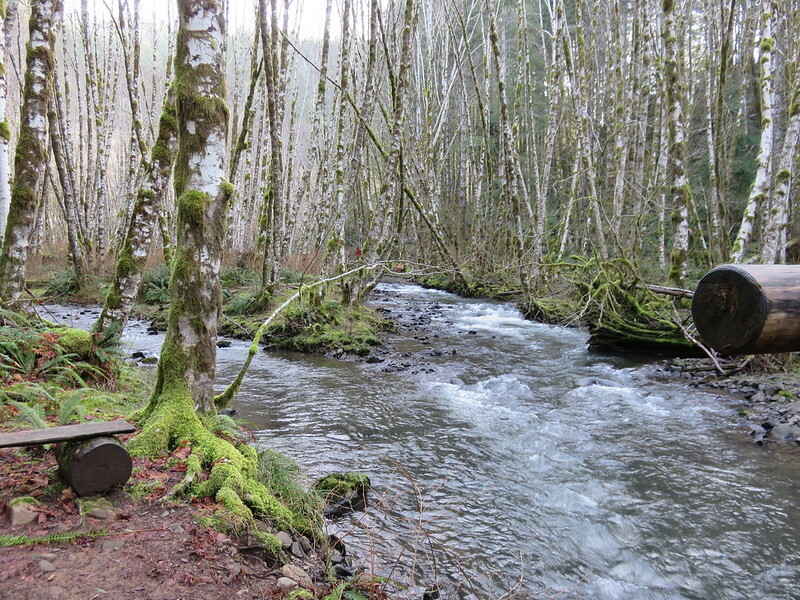 We chose to start at a small trailhead just before reaching Gales Creek Campground. 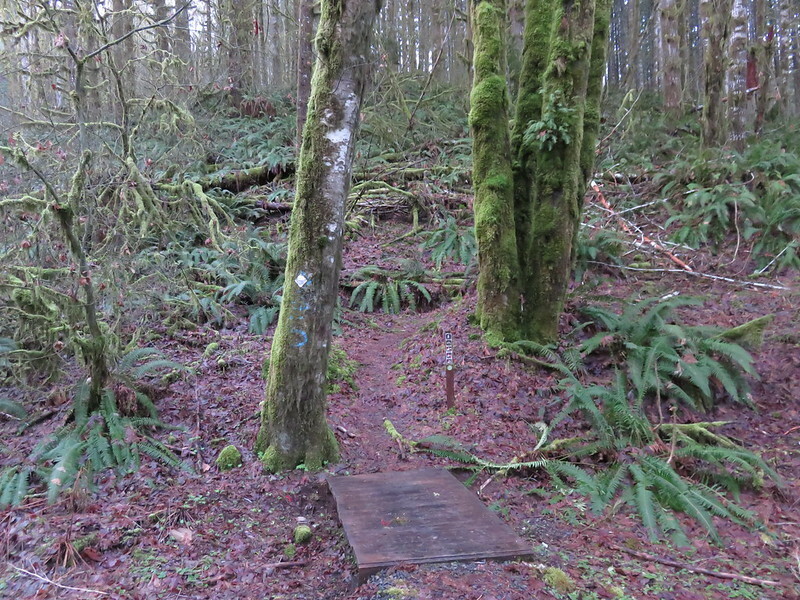 A small post and footbridge were the only markers for this starting point. 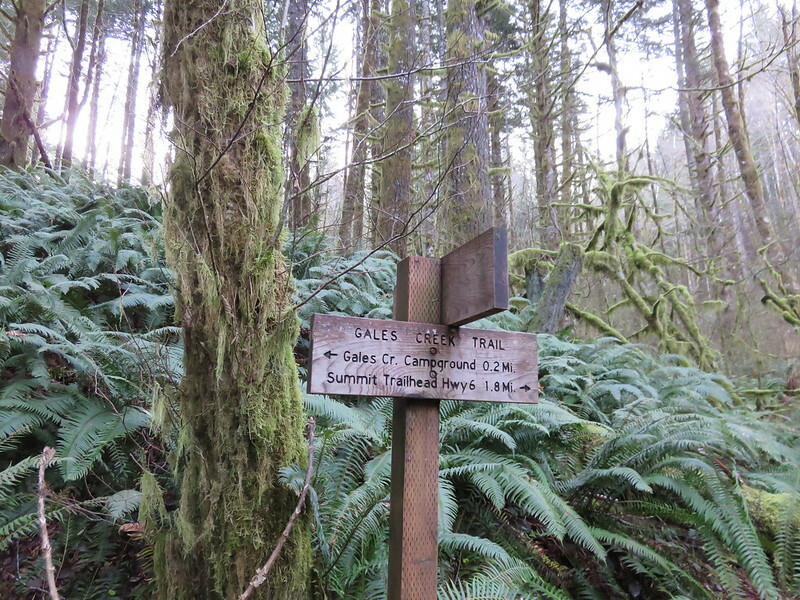 A short distance from this trailhead the path joined the main Gales Creek Loop at a well marked junction. Our plan was to take the trail to the highway and then walk up the road a few hundred feet and cross into Rogers Camp, another possible trailhead and staging area for Off-Highway Vehicles which are allowed on the south side of the highway. At the entrance to Rogers Camp we headed for a trail sign positioned between the entrance road and a highway equipment yard. 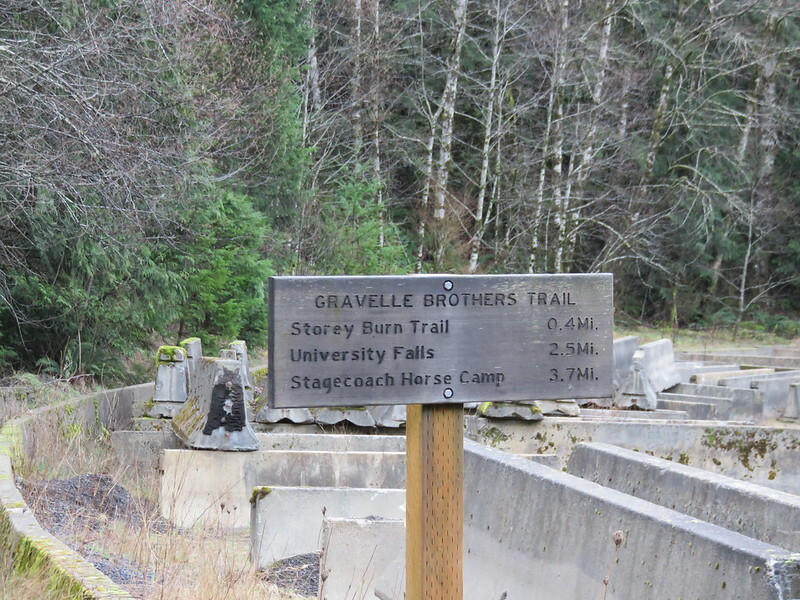 Here the Gravelle Brothers Trail began. Following signs for University Falls we stuck to this non-motorized path reaching a footbridge and little bench at the Devils Fork Wilson River. 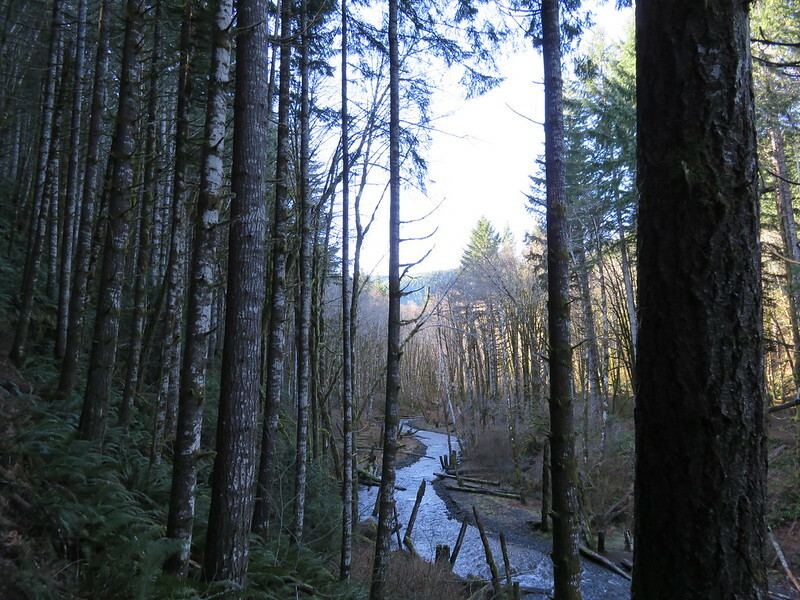 After crossing the river the trail turned south and began to climb through the forest toward University Falls. A colorful sign greeted us near University Falls. 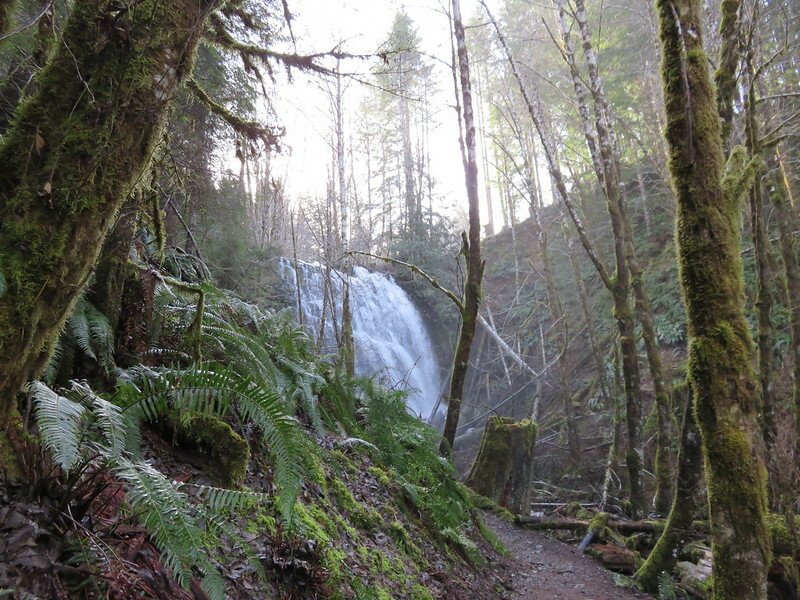 A short trail from the sign to the right led down to Elliot Creek but the falls were almost entirely obscured. To get to the falls we returned to the sign and took the trail directly behind it a short distance to the falls. The falls were going strong making for an impressive show. After visiting the falls we returned down the trail and recrossed the river. Not too far from the crossing we arrived at a trail junction we had passed earlier. 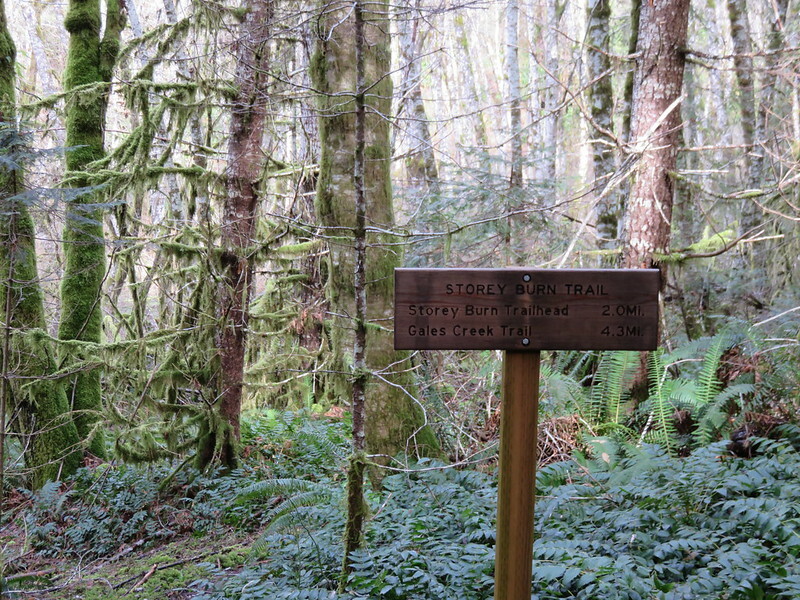 Here we turned left on the Storey Burn Trail. 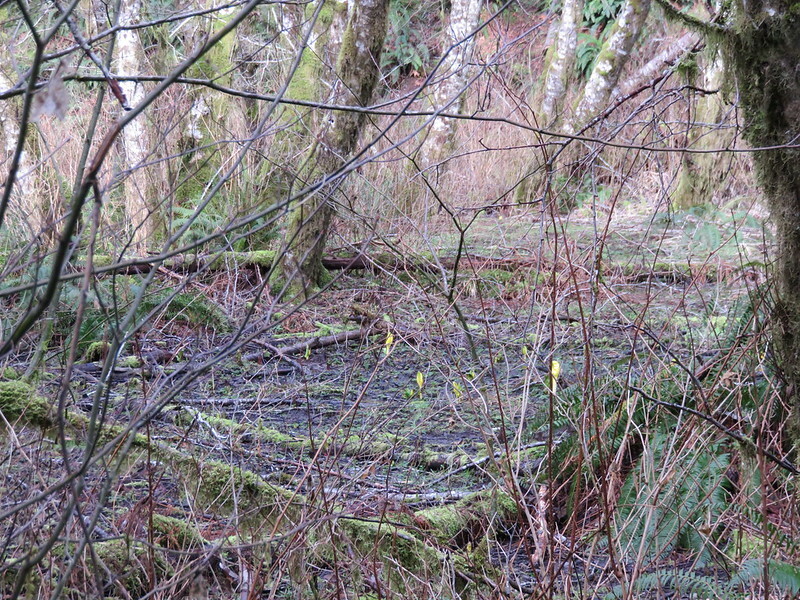 This trail lead us past a marshy area along the river where skunk cabbage was begging to bloom. We then climbed away from the river and passed beneath a highway bridge returning to the north side of Highway 6. 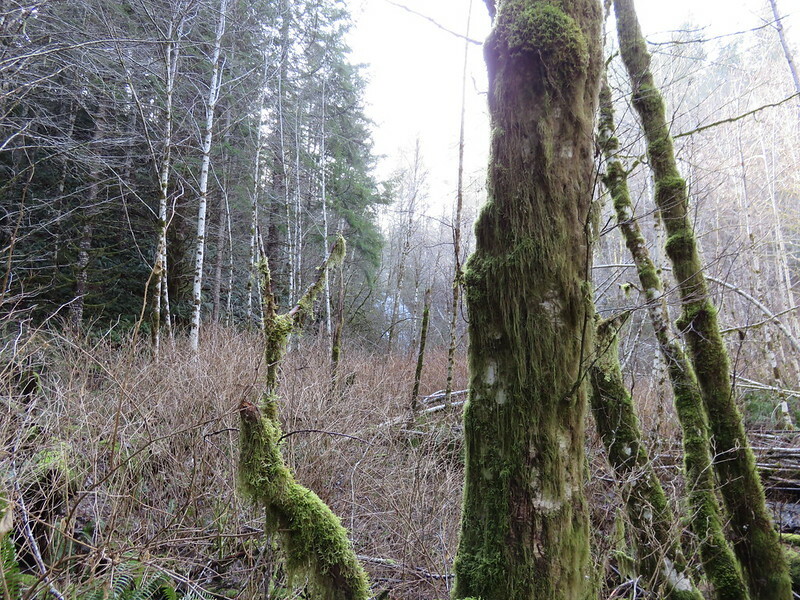 The Storey Burn Trail climbed steadily along hillsides up to Storey Burn Road, another possible trailhead. 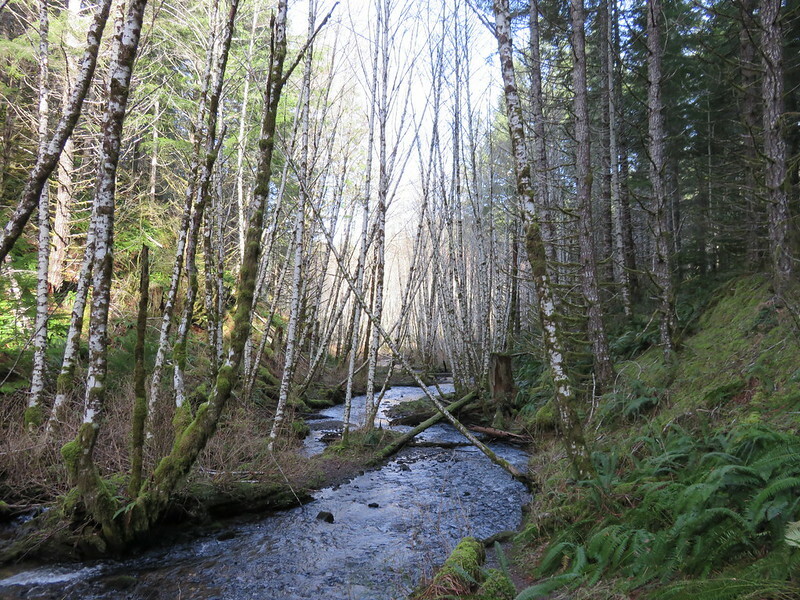 We crossed the road and continued on toward Gales Creek Campground. We were mostly going downhill now in a much quieter forest. While on the south side of the highway the sounds of Off-Highway Vehicles and target shooters competed with the water and the birds. Even after returning to the north side of the highway where OHV are banned there was an almost constant barrage of gunfire. Here on the final stretch birdsong and running water became the only sounds making for a pleasant final stretch. 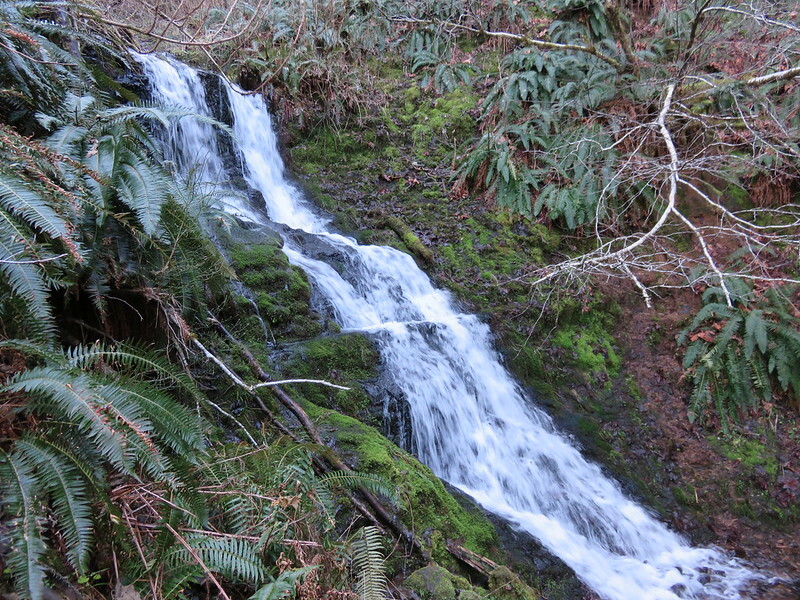 The trail also passed by small but scenic Slide Falls. A final trail junction awaited, just .8 miles from Gales Campground. 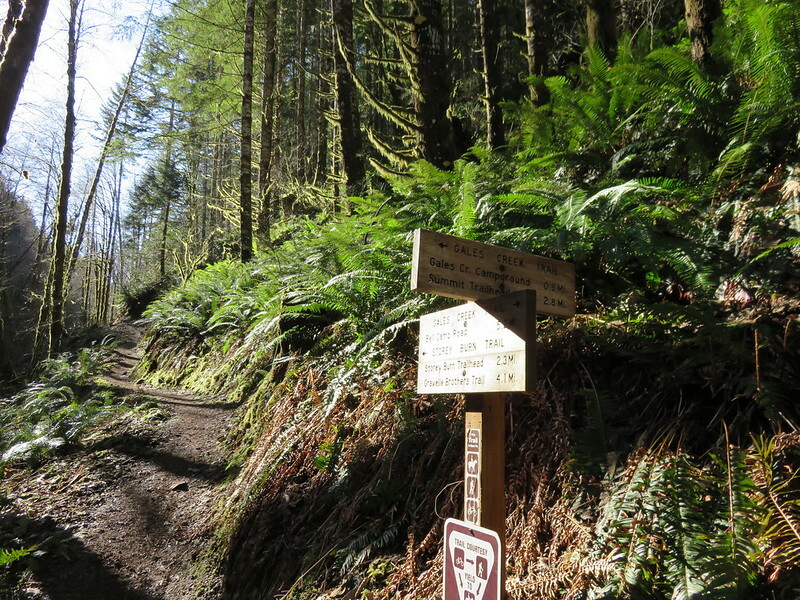 The final portion of the trail paralleled Gales Creek before arriving at the trailhead. 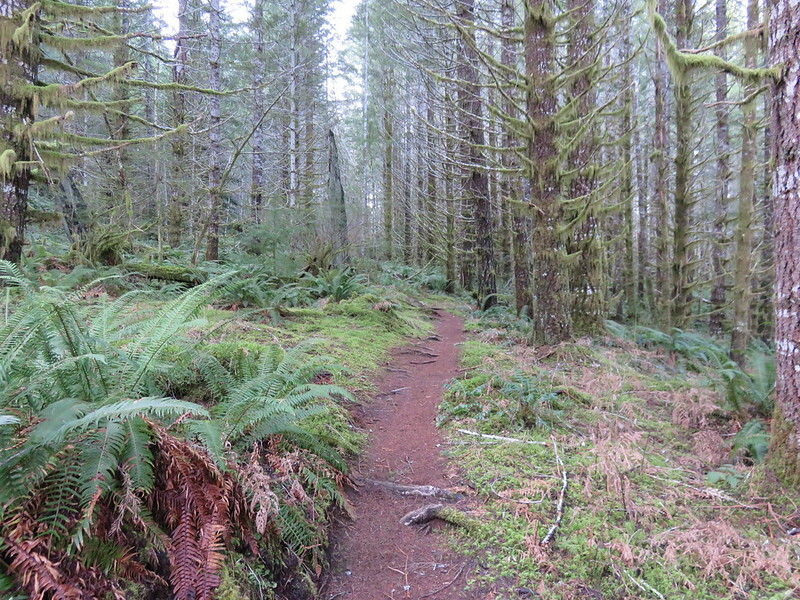 We could have walked 300 yards up the road to our car and the other smaller trailhead or take a connector trail through the forest. We chose the trail which wound around and gained some unnecessary elevation before dropping us back down to our car. We both agreed that we should have taken the road 🙂 Happy Trails!